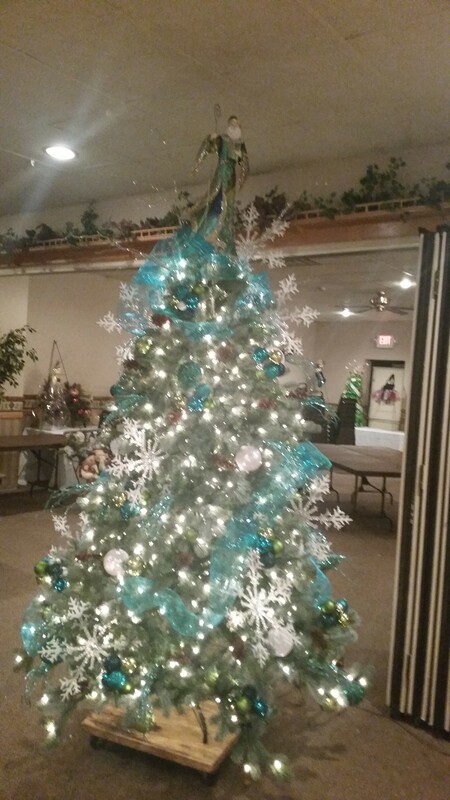 More than 300 people attended the 19th Annual Kick Off the Holidays celebration was held on Saturday, Nov. 22, at the Dixon Elks Lodge. SOILL Northwestern/Area 1 raised more than $56,000 at the event, including more than $10,000 in sponsorship. Barry Tillema was the Global Messenger who spoke to the crowd about his experiences in Special Olympics. Thanks to committee members Eligh Barton, Kristin Buckley, Carole Crafton, Kalah Carson, Lyndsey Kelly, Lisa Kennay, Janet Kipping, Leslie Nelson, Christine Scheffler (2014 SOILL Outstanding Volunteer) and Judy Young. The Young Professionals Board (YPB) of Special Olympics Illinois hosted their 4th annual fundraising event to benefit the athletes in the Chicago/Area 3 program. Thanks-for-Giving, a wine- and beer-tasting event, was held at Public House in Chicago on Nov. 13. More than 120 guests enjoyed the evening, which included tasting of many delicious varieties of wine, beer and champagne. Abundant hors d’oeuvres and desserts were available throughout the night. The event was planned by a committee of YPB volunteers and was co-chaired by Rebecca Bradley, Megan Trippel and Monica Grossnickle. Additional committee members include Kaelin Sweeney, Matthew Sweeney and Alia Zander. Generous donors contributed to a raffle and silent auction which included gift cards for dinner, theater and hotel accommodations, as well as sport tickets to enjoy the Chicago Bears, Chicago Bulls, Chicago Cubs and Chicago White Sox games. 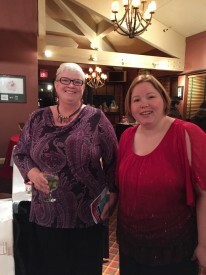 The event raised more than $13,000 to benefit SOILL Chicago/Area 3. The University of Illinois-Chicago men’s and women’s gymnastics teams invite all Special Olympics athletes, families and friends to come out to the teams’ first meet of the season at 7 p.m. on Friday, Jan. 9, at the UIC Pavilion in Chicago. Tickets are just $4 a person. If interested in attending, please RSVP with Jacquelin Kogut, SOILL Chicago/Area 3 Manager of Sports Training & Education at 773-278-2178. Attendees will need to purchase their tickets at the UIC Pavilion box office. View flyer about event. Special Olympics Illinois is excited to partner with the University of Illinois for the inaugural Illini Plunge on March 7! Participants have the opportunity of a lifetime, as they can take the Plunge inside Memorial Stadium, the official home of Fighting Illini Football. This is the perfect opportunity for Plungers to showcase their Illini pride and help support the athletes of Special Olympics Illinois. Plungers will take their icy dip ON the field, inside a pool, surrounded by their fellow Orange and Blue fans! Participants must raise $75 in donations and will receive their official Plunge hooded sweatshirt and admission to the post-plunge party. To register to Plunge at Memorial Stadium or any of our other 20 Plunge locations, visit www.plungeillinois.com. The latest edition of the Eastern Prairie/Area 8 newsletter is hot off the presses. Read it here. For SOILL East Central/Area 9 athlete Eldon Hatfield, football comes naturally. In addition to participating in Special Olympics sports like the shot put, Eldon played Junior League Football for the Charleston Trojans this year. On Sept. 14, Eldon competed in the NFL’s “Punt/Pass/Kick” competition, a program teaching children the fun of learning football fundamentals in an engaging and supportive non-contact environment. Eldon won first place at the local PPK competition at the Charleston JFL Fields and was able to advance into the “Punt/Pass/Kick” sectional competition in Tinley Park. 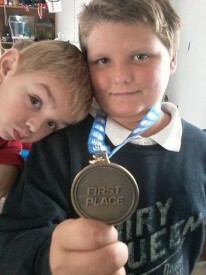 Eldon is featured with his younger brother and his first place medal in the PPK competition. The latest edition of the East Central/Area 9 newsletter is hot off the presses. Read it here. 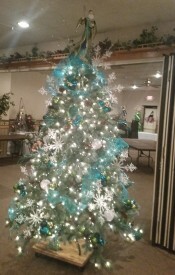 11th Annual Special Gifts Holiday Dinner was held on Nov. 22 at Kemper Lakes Golf Club. More than $28,000 was raised to support the athletes of SOILL Northeastern/Area 13. The committee composed of Special Olympics parents did an amazing job in offering more than 100 silent auction items, 10 live auction items and multiple raffles. The athletes in attendance completed a very entertaining skit while emcee Mike Babicz and athlete speaker Katie Millar made the entire night a memorable experience for everyone. 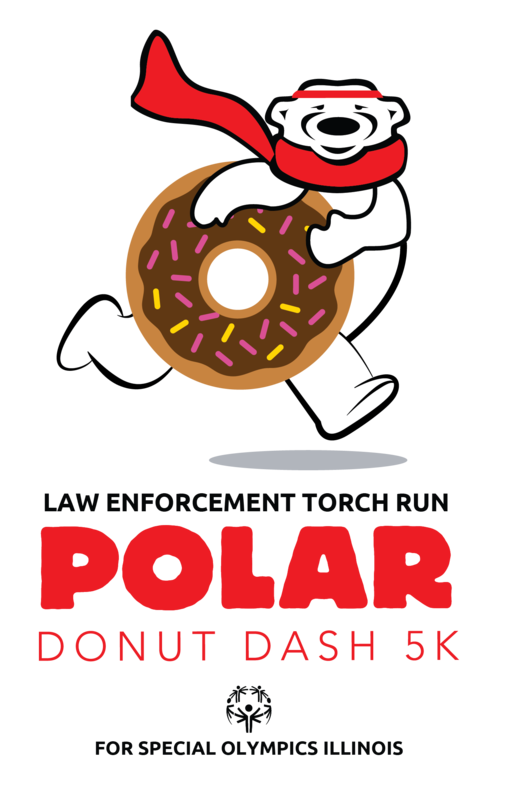 The Law Enforcement Torch Run will be hosting its first-ever Polar Donut Dash 5K in conjunction with the Carbondale Polar Plunge held on the SIU Campus. This is the only 5K around in which you will not only test your speed but your ability to eat donuts! Participants will be treated to multiple donut stops along the route and will receive a 1-minute deduction from their overall time for each donut they consume. Awards will be given to the top three individuals in each age category. Besides bragging rights, all Dashers receive an official Polar Dash T-shirt and entry into the post-Plunge party. The post-Plunge party consists of free lunch for all Plungers/dashers and the chance to win some great prizes. Time – Registration 8:30 a.m., Race Start Time: 9:30 a.m. Individuals who register for the Dash by Feb. 9 will receive a commemorative Polar Dash T-shirt. Individuals who register after that date will not receive a shirt. Plunger & Dasher – Must pay $30 Registration fee & raise a minimum of $75 to Plunge.